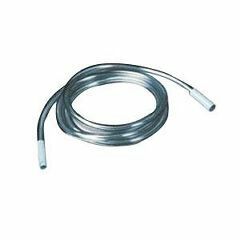 Bard Extension Tubes - 18"
To attach foley or external catheter to night drainage or leg bag. I wear 32 oz leg bag below the knee, need extension tube to reach from supra-pubic catheter. Tried another non-latex, transparent tube. It was stiff, uncomfortable, hard to position properly, threw away as soon as I could get more of this latex extension tube. Hard to join tubing. Hard joining tube to bag. I like this tubing because it is latex-free. BARD extension tubes are far superior to any others I have tried except that they are awkward to store. Not as flexible as some extension tubing but the price is right. My wife wears a suprpubic catheter. At night she has on a night drainage bag, but when she rolls over the catheter gets pulled sometimes. Will the bard 18inch extension tube work with the bard drainage bag? and if so, how does it work? Bard just got them back in. Is this 18" tube the yellow latex or clear latex-free type? do you have an 8 or 10" extension tube for a catheter & leg bag?